(b) allow us to express our gratitude to the many people who helped make the guidebook possible. The preservation of the park: for the most part the Friends have been the watchdog group, struggling to keep the park from being usurped for other non-green, non-public uses. I have no doubt that without the work of the Friends, City Park as we know it today would not be there. Secondly, the gazetting of City Park: this was in no small measure made possible by the National Museums of Kenya which has succeeded in gazetting most of the park (an area a little more than 60 hectares) as a national monument. A biodiversity survey at City Park documented more than 1000 species of animals and plants. 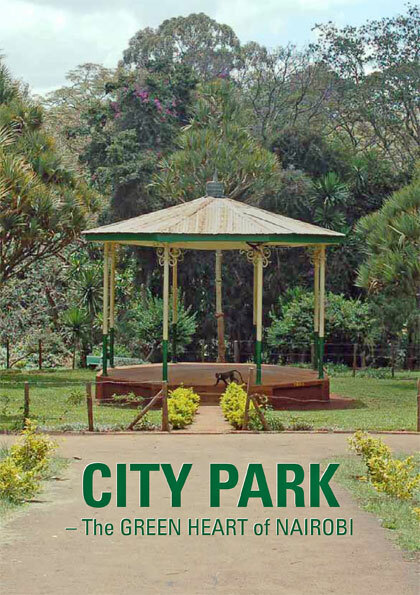 This had the combined input of many National Museum scientists, and confirmed City Park as an important site for biodiversity, providing a unique opportunity for Nairobi residents, including students. Finally, I think it is an achievement that the Friends have managed to last and remain vigilant for 17 years. Often under very precarious conditions: we’ve investigated claims, rallied the press and the public, communicated with various government offices, sought dialogue with the Nairobi City Council, saved parcels of land from ‘development’, raised funds, organised clean-ups and tree-planting. This would not have been the case if it were not for the amazing individuals, many of whom have served with me on the Friends committee for years, and who give voluntarily of their energy, drive, time and resources. I want to acknowledge a few of them by name: Nani Croze, Dino Martins, Valerie Leakey (who passed last year), Akbar Hussein, Frederique Grootenhuis, the indomitable Jyoti Nadkarni (our previous Chair), Heather Elkins and Sanjay Desai. For the guidebook many thanks goes to Dino Martins for coordinating both the biodiversity survey and the production of the guidebook. Thanks too to Gordon Boy for collation and editing and Job Ballard for layout and design. I also want to acknowledge and thank Najma Dharani, Martha N. Mutiso and Jeridah Ambiyo and the many many others who in different ways contributed either to the knowledge contained in the guidebook or invaluable resources like the beautiful photographs used in the guidebook. The National Museums of Kenya; the Parks Department, of the Nairobi City Council and the guidebook sponsors – the Aga Khan Trust for Culture, whose generous sponsorship covered most of the cost of the biodiversity survey and the production of the guidebook. Ultimately it is the support of the larger community, including many of you and others that brings us to this point – let me encourage you to even greater participation – Join the Friends and make City Park your own! The guidebook is available for purchase at KES 450 per copy, order one today!